Since the year 1949, in the framework of the local holidays of The Virgin of Las Mercedes, is carried out in the picturesque town of Guararé, the National Festival of the Mejorana, a tradition created by the Professor Manuel F. Zárate, together a group of friends and close persons of its native land, which was officialized by means of the Law #91 of 1955. Since then, in the month of September of each year, this town is visited by a large quantity of folkloric delegations of all the country, with the common objective to enjoy, to divulge and to preserve the Panamanian folklore. Also, a representative of the festival with their princess and ladies are chosen. Here at the festival of La Mejorana Panamanian folklore takes the forefront. 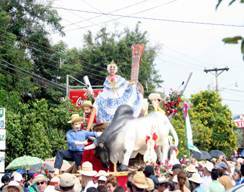 Folklore plays an important role in the celebrations along the Azuero Peninsula. These celebrations help draw attention to the area and push the real estate investment into new levels. Panama Beach Real Estate is in high demand. Property on the Azuero Peninsula is appreciating daily. Visit Panama and see all the beach properties and ocean view properties towns like Pedasi have to offer.